If co-teaching sounds like it could lead to some conflicts, you’re not wrong—especially when it comes to a charged topic like climate change. It’s part of the reason why it’s rarely done in academia. But working through those disagreements, even in front of the class, is part of the point. This semester, Environmental Studies Professor Sarah Ray and Geography Chair Rosemary Sherriff joined forces and invited other HSU professors across different disciplines to teach students about climate change. Ray and Sherriff share a common interest in environmental issues, but their backgrounds and expertise sometimes bring them to different conclusions about how that goal should be achieved. That’s a good thing, and its usefulness is especially appropriate when it comes to a topic like climate change. Climate change, of course, is a high-profile issue, and even in the scientific community where it’s largely accepted as true, there are disputes over how to study, measure, address, and teach about it. While it’s a common topic of debate in political circles, it is also widely misunderstood by the general public—or, at least, there’s a glut of questionable information out there. Sherriff and Ray’s goal in the course (ENST 480 / GEOG 473: Interdisciplinary Perspectives on Climate Change) is to bring a variety of disciplines and perspectives to the topic. Climate change affects a huge array of topics—Hurricane Katrina, for example, included physical sciences like engineering and meteorology, as well as social science subjects like politics and race. Sometimes, experts in those disciplines think they know what needs the most resources, or what should be the highest priority when tackling climate change. But Ray says a subject so complicated needs broader, more interconnected analyses. Throughout the semester, they’ve invited HSU professors from a variety of science fields such as hydrology, oceanography, and wildlife, to share how their work provides context for climate change discussions and offer a critical view of the effects of and responses to it. Sherriff and Ray also invited professors from humanities and social science fields, like Journalism Professor Vicky Sama, whose Introduction to Video Production class had spent the semester creating news and informative videos. Sherriff, Ray, and Sama partnered to have students in both classes create 30-second public service announcements about climate change. 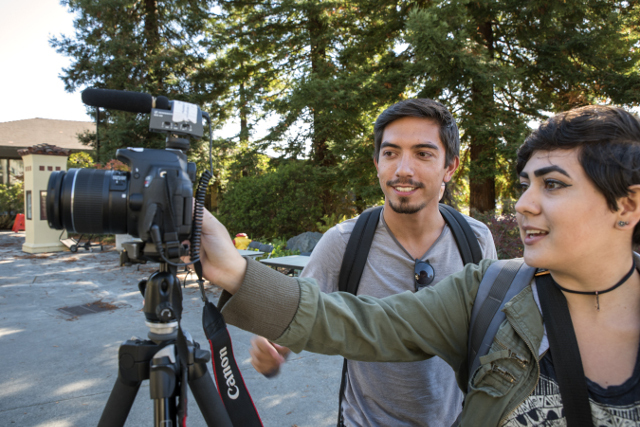 Joshua Diaz and Brandie Monreal film a climate change public service announcement on the quad. Sama’s question highlights another point of the collaborative climate class. At the beginning of the semester, Sherriff says, almost every hand would have gone up. Being forced to challenge their own understandings of climate change has produced some doubt. But again, that’s a good thing. The video project with the journalism class encourages all of the students to dismantle their climate change perceptions and repackage them for a broad audience. And it comes at a perfect time in the course, Sherriff says, when the students had reformed their ideas about climate change and are ready for a communication tool to repackage their ideas. So while one group of students goes to the quad to film reactions to Donald Trump quotes about climate change, another group performs a rap about melting polar ice caps with props and a polar bear costume.